Some of the first green shoots to appear in my garden are those of Wild garlic. As early as mid March I saw small, green, pointed fingers reaching for the sky. About ten years ago we stumbled across a huge patch of wild garlic in a local woodland. We had wandered off the beaten path, following our dog Frankie. We smelt the garlic before we saw it, it is such a distinctive smell and so pungent, especially if trampled under foot. We filled our pockets and feasted but then never managed to find the spot again. 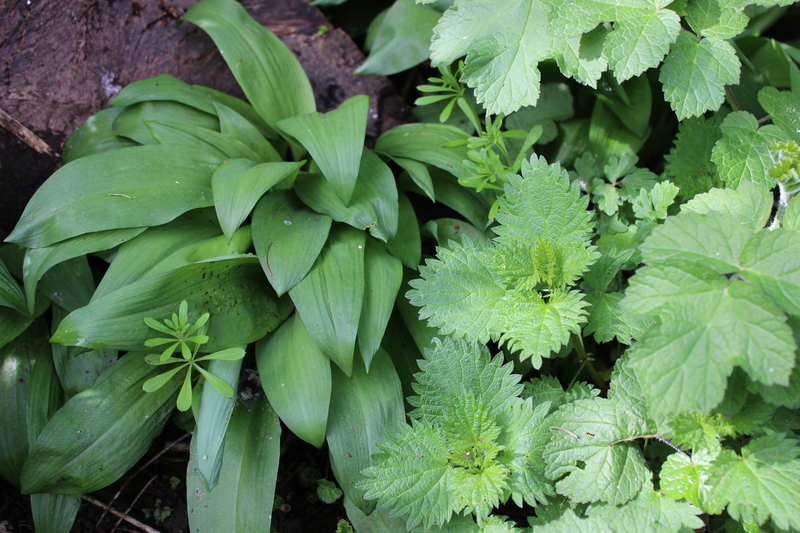 Wild garlic growing with nettles and cleavers at the bottom of my garden. Wild garlic is a relatively new addition to my garden. A friend of my mother has a front garden filled with wild garlic, the plants have multiplied over the years until the point where they have totally overtaken her garden and she wanted rid of them. My family and I happily took away buckets full of plants and carrier bags of leaves to make into pesto. (The pesto was delicious) I planted lots of her plants around the shady margins of my garden. It is typically a woodland plant , so happiest in cool, damp corners. Last spring I was rather pre-occupied with a new baby boy to care for, so I left the wild garlic to its own devises. It turns out that was the ideal thing to do. as its best not to harvest leaves in the first year after planting or transplanting. This allows the plants to get established and provide a good crop the following year. My plants are now doing very well as we already have more leaves than we can use.It doesn’t keep well, so i have found picking just before use to be the best idea. I may try making pesto again and I am wondering if it would freeze well? 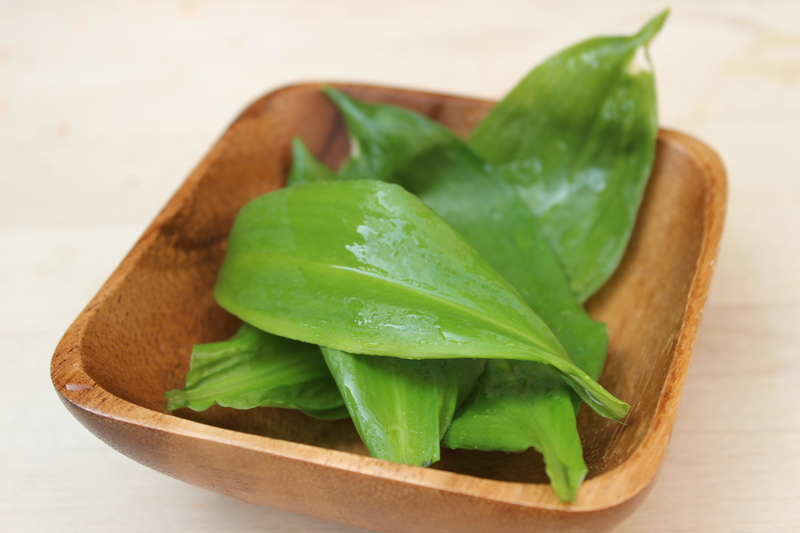 I have been eating the wild garlic leaves for the last few weeks now, treating the plants in a cut and come again manner. I have been adding raw leaves to salads, stirring it into pasta sauces, finely chopping it and adding a lovely flavour to omelettes and, as my garlic breath will attest to, munching on the leaves straight out of the garden. 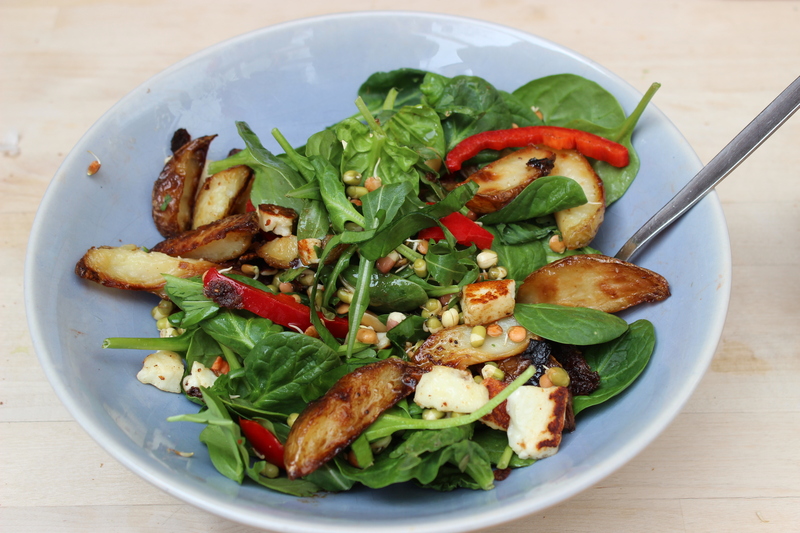 A lunchtime salad of rocket, spinach, peppers, sprouted seeds, haloumi and potatoes. The plants will soon send up pretty star-like white flowers, these taste good too and look very pretty sprinkled over dishes. I am getting a lot of mileage from wild garlic and am glad to have such an early, pretty and tasty perennial in my garden. This entry was posted in Uncategorized and tagged Dinner, food, food from my garden, Permaculture, Permaculture Diploma, plants, wild foods, wild garlic by emilycrofton. Bookmark the permalink.